Yesterday I guest posted at Toys in the Dryer. 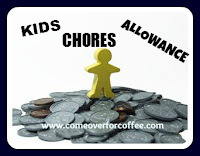 I wrote about kids, chores, and allowance. Today’s post is a continuation of that post. Have you read that post yet? It's my first ever guest post! You really should go read it. Go ahead. I'll wait. We have kids. Our kids do chores. 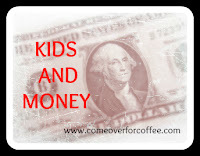 Our kids get allowance. Now what do we do with that money to help them learn how to handle money correctly? I can tell you how we do it at our house. Our system has been in place for about a year now and is working pretty well. Getting the system down and working out the kinks was a hassle. I’m hoping that by sharing our ideas with you, we will be able to save you some hassle on your end. Each week, our boys receive half their age in cash. For example, our 9 year old gets $4.50 a week for his allowance. That amount may sound high, but stay with me. There’s a method to the madness. The deal behind the allowance is that we no longer buy the boys much besides clothes and food. Our boys are now responsible for paying for life’s extras – gifts for birthday parties they attend, souvenirs from vacation, new Lego sets, and Halloween costumes. I also require gifts for each member of our family for birthdays and Christmas. When it’s allowance time (usually on a Sunday afternoon every three or four weeks), I grab a cup of coffee and meet with the boys one at a time. They each own a plastic coupon organizer that we use to help them budget. The boys have envelopes in their organizer labeled for the various things they are responsible for. I hand them their cash and then help them divvy it up among the envelopes. The first envelope we fill is their giving envelope. Each boy puts 10% into an envelope to take to church on Sunday. They are learning how to give! Then we work on the other envelopes. Right now, they are working on saving up for Christmas presents for the family, Halloween costumes, and a birthday gift for Son1 (he’ll be 11 in November). 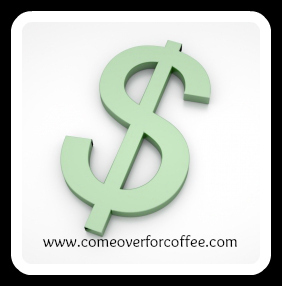 Any money above and beyond these categories can go into their spending envelope. When it comes to spending, we give them latitude. We have final say on what they are allowed to buy, but if they want to spend all their money at the concession stand at a baseball game, we will let them. When they realize that they are broke and have nothing to show for it, they will spend better next time. We’ve seen the three of them pool their money to get a big ticket item (usually a mega-cool Lego set). The negotiating that goes into that is good practice for them. Allow me to highlight a side benefit to them having their own spending money. When we go shopping, I don't have to say no anymore when they ask for this toy or that game. I can say, "Sounds like a great idea! Is it on your list? Do you have enough spending money?" Then they have to say yes or no to the purchase - not me! I don't have to be the bad guy who always says no! And our shopping trips are much more pleasant. We do have one major spending rule – no spontaneous shopping. Each purchase must be planned out. We have the boys write down what they want to buy and how much it costs. Then they have to wait at least three days. If they still want it, and if they have enough money, we will take them shopping to get that thing they want. I tell them that I don’t walk into Target without a list and a budget amount in mind, so they won’t either. Forcing them to plan has really saved them from some foolish choices and teaches them how to save towards a goal. Each of our boys has a different money personality. We have a spender, a saver, and a giver. We work at fostering their strengths and training away the weaknesses (Hmmm – that sounds familiar. Lots of talk about strengths and weaknesses on this blog lately). How do you handle allowance at your house? How are you teaching your kids about money? 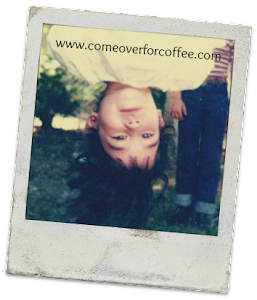 Linking up with Coffee Friday, and Calm My Crazy.